Camco 6x9' Reversible Awning Leisure Mat. 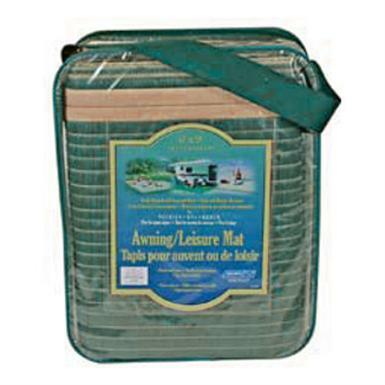 Helps keep dirt from being tracked into your RV... great for picnics and beach outings! Made of durable, mildew resistant materials with rust-resistant grommets and ground stakes (included). Woven design allows dirt and water to drain through... cleans easily with soap and water, too! Green color. Please Note: Carry bag is not included.